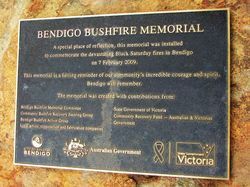 A memorial commemorates the Black Saturday Bushfire of 2009 and pays tribute to emergency service workers, the people of Bendigo and organisations and people who were involved in the aftermath of the fire. 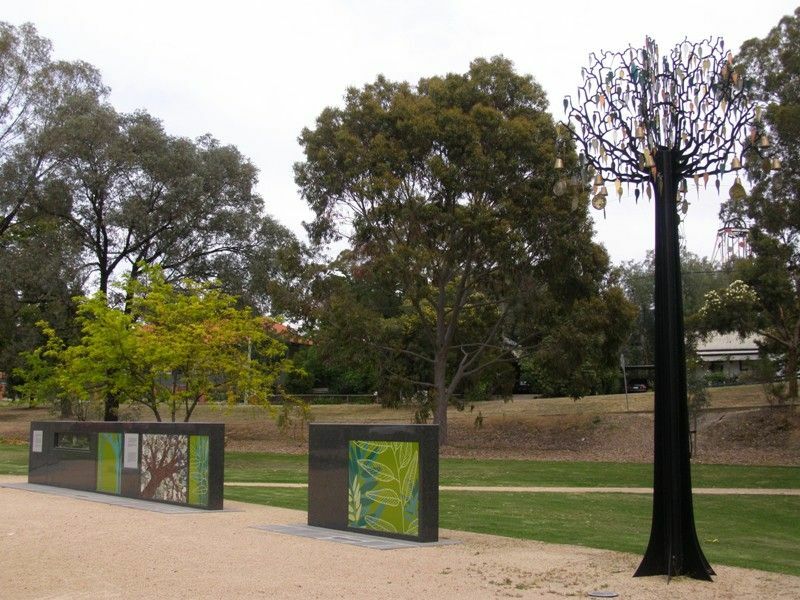 Designed by City of Greater Bendigo's Landscape Architect Karoline Klein, the memorial references the timeline of events before, during and after February 7, 2009. 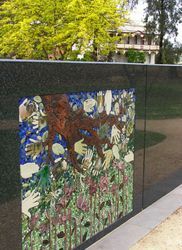 Themes of destruction, remembering and renewal are revealed in the sculptural wall through an interpretation of molten metal, a sealed window displaying items salvaged after the fire, text, photographs and art tiles. 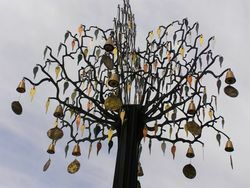 A stand alone ‘Fire Tree’ designed by well known local artist Anton Hassell and constructed from steel stands some five metres tall makes the final statement in the memorial journey. On Black Saturday, the fire came within 2 kilometres of the Bendigo CBD, destroyed 58 homes and took the life of local resident Mick Kane. 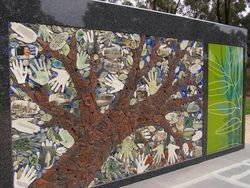 On Saturday, 7 February 2009, Victoria experienced and unprecendented and catastrophic event as firestorms raged through much of the state. 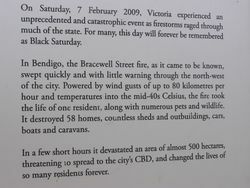 For many, this day will forever be remembered as Black Saturday. 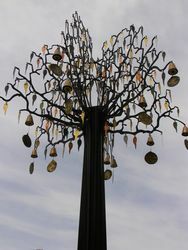 In Bendigo, the Bracewell Street fire, as it came to be known, swept quickly and with little warning through the north-west of the city. Powered by wind gusts of up to 80 kilometres per hour and temperatures into the mid-40s Celsius, the fire took the life of one resident, along with numerous pets and wildlife. It destroyed 58 homes, countless sheds and outbuildings, cars, boats and caravans. In a few short hours it devastated and area of almost 500 hectares, threatening to spread to the city's CBD, and changed the lives of so many residents forever. 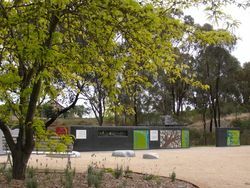 Less than two kilometres north-west of this site, Bendigo resident Mick Kane tragically lost his life - fighting, like so many others - to save the home and family he loved under impossible circumstances. Many residents were forced to flee for their lives or watch their precious homes and possessions burn. 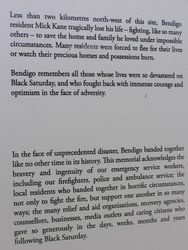 Bendigo remembers all those whose lives were devastated on Black Saturday, and who fought back with immense courage and optimism in the face of adversity. 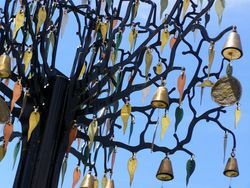 In the face of unprecedented disaster, Bendigo banded together like no other time in history. 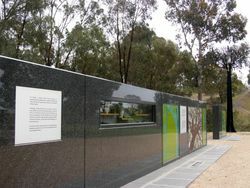 This memorial acknowledges the bravery and ingenuity of of our emergency service workers, including our firefighters, police and ambulance service; the local residents who banded together in horrific circumstances, not only to fight the fire, but to support one another in so many ways; the many relief aid organisations, recovery agencies, counsellors, businesses, media outlets and caring citizens who gave so generously in the days, weeks, months and years following Black Saturday. A special place of reflection , this memorial was installed to commemorate the devatating Black Saturday fires in Bendigo on 7 February 2009 . 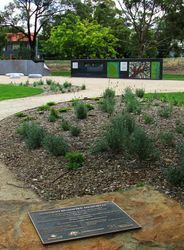 This memorial is a lasting reminder of our community's incredible courage and spirit.